Make sure you see Thibaut Courtois' match-winning penalty. Foot = traction engine. We'll see you tomorrow for more pre-season fun and games. Arsenal in action. See you there! What a penalty! Unstoppable. Thibaut Courtois smashes it home left-footed, right into the top corner. One of the best spot-kicks I've ever seen! Courtois dives to his left and saves. Into the corner. There have been some excellent penalties. Courtois gets a hand to the ball but it is powerfully struck and he cannot keep it out. Very, very cheeky. Sirigu shapes to dive, ball goes the other way. Smashes it. No chance for Courtois. Waits for the keeper to dive and then slots his penalty into the opposite corner. This time it is Courtois who dives to his right and makes a very decent save. Salvatore Sirigu dives to his right and makes a one-handed save. Courtois dives the wrong way. Keeper guesses correctly, diving to his left, but once again the spot kick is right into the corner. This one is smashed, hard. No chance for Courtois. Again, the keeper dives the correct way, down to his right, but again the penalty is precise and finds the back of the net. So, so close for the Chelsea keeper, who dives the correct way but the penalty is low and slotted into the bottom corner. Grumpy old man alert but: the time taken between full-time and a penalty shootout is ridiculous these days. An age. Almost the winner! Sub Jean-Christophe Bahebeck fires over for PSG. Right, let's be having a winner. We've all got homes to go to. Whatever happens this season PSG look like they will be some side to watch in the champions league. Lucas Maura has been excellent today then add in Cavani, Pastore and the likelihood of Di Maria and they will be some side going forward. Their only weakness for me is in the defence. Brilliant performance so far today. Late night spot-kicks anyone? Looking likely as the sting has really gone out of this game. Sutton, Shevchenko, Torres - will Radamel Falcao be another striking flop at Chelsea or can he refind his feet? The Colombian's first touch to tame a cross is brilliant on this occasion but he delays his shot and it's well blocked. There are over 60,000 fans in the stands. We will go to penalties as it stands. Edinson Cavani swings a woeful shot over from the angle before Eden Hazard is replaced by Juan Cuadrado. Second season syndrome? He needs the reverse. Radamel Falcao is straight into the action to get back and win the ball for the Blues, he then finds Loic Remy whose low shot is held by Salvatore Sirigu, just on in goal for PSG. Oscar, Willian, Radamel Falcao and Loic Remy all come on for Chelsea. It's Falcao's first run out in the number nine shirt. He gets a huge reception in Charlotte. Excellent finish from Victor Moses by the way. Didn't slash at it, just guided it in. But the pass was majestic. Cesc Fabregas made a mess of the chance a few moments ago but back in the architect's chair he drafts a gem of a pass. Head up, floats the ball over the top, it is inch-perfect for Victor Moses to run on to and volley crisply home. Big acrobatic celebration from Nigerian winger. A fixture in the coming season? Thiago SIlva gets a huge ovation as he comes on at the back for PSG, also on is Edinson Cavani. The Parisians come straight down the other end and Lucas Moura drags a half-volley past the post. Opening up. Should score. PSG self destruct at the back and the ball falls at the feet of Cesc Fabregas, he has all the space and time in the world but he still uses too much of both, delaying and delaying his shot and eventually seeing his shot blocked. Victor Moses rattles the loose ball wide. Diego Costa swings an arm in the direction of Serge Aurier, it's not particularly violent but it riles the Ivorian, who hacks Costa down. Vicious. That's a shocker and it's a booking. That row has been brewing since 30 seconds into the game. Jose Mourinho won't be happy with this. I know pre-season doesn't really matter but Chelsea look like they are phoning it in. Pretty half-hearted stuff. Chelsea growing back into the game after a slow start to the second half. Diego Costa has landed more verbal blows than shots on goal so far tonight though. Eden Hazard is definitely still in holiday mode. 'Let's go Diego!' shouts a particularly vocal fan as Costa chases down a long ball into the channel. Chelsea second best at the minute as Thiago Motta tests Thibaut Courtois with a curling strike from 22 yards. Three changes for PSG too. In come Marquinhos, Thiago Motta and Adrien Rabiot, off go Benjamin Stambouli, Marco Verratti and David Luiz. Chelsea make three changes: Thibaut Courtois for Asmir Begovic, Kurt Zouma for Gary Cahill and Ramires for Jon Mikel Obi. Here we go, back under way. Both sides have made changes, I'll confirm and get back to you. David Luiz is wearing flip flops and a t-shirt. I guess he's not playing in the second half! I'm gutted to see Di Maria leave. His performances in the Copa would have helped his morale and confidence and how often do you see players struggle in their first season (Henry and Bergkamp even did) I'm sure he would have ripped up the league this season and he's world class. Three goals in his first 5 including that sublime chipped goal in the 5-3 loss to Leicester. As a football fan I'm sorry to see him inevitably now leave. Manchester United changed all 11 players in one hit after the hour mark earlier on. Will Jose Mourinho make some switches now? It sounds increasingly like Angel Di Maria is an ex-Manchester United player. The £60m man never really did it in the Premier League. He played very well in a defeat at Leicester as I recall - but that's not really £60m worth of performances. Re Abdul Kabir's message. Chelsea only lost twice last year. 2-1 injury hit Newcastle (who ended up having their third choice keeper in goal in the second half) and 5-3 at Tottenham. You beat Swansea 4-2 and 5-0 and Everton 6-3 for starters so you's didn't do badly not parking the bus in them matches. You're much better when you's go for it in matches. What a save that is! Asmir Begovic was under a bit of stick for his performance in Chelsea's last pre-season game but he's having a fine game. A brilliant one-handed stop to keep out Lucas' low shot. Cesc Fabregas and Nemanja Matic, weak? Not so sure about that Bamba. Another good save from Asmir Begovic. big, big hand to get to Jean-Kevin Augustin. PSG turn it on and Chelsea can't handle it. Twice Lucas goes down under a challenge but twice he's waved to his feet before Marco Verratti ghosts in behind Gary Cahill, unmarked, but Asmir Begovic is out quickly and he can only chip it wide. What a run from Lucas Moura! The Brazilian drives at the heart of the Chelsea defence, has them backed up to the 18-yard box and then cracks in a drive, it deflects up off the block from Gary Cahill and is flying in until Asmir Begovic beats it away with a strong left hand. Chelsea seeing more of the ball but Eden Hazard has been very quiet thus far. Victor Moses on the opposite flank had one early run but not seen the ball since. Good game again. Chelsea counter well, finding Diego Costa on the left of the box. Tight angle, but he hammers in a left-footed drive which is tipped on to the outside of the post. Booom! He could have been sent off a few moments ago but Zlatan Ibrahimovic sweeps PSG into the lead. It's a cracking finish too, made to look very easy. Jean-Kevin Augustin rattled the post from 20 yards and Zlatan smashed it in left-footed on the bounce. Could have easily put that over. Naughty! Zlatan catches John Terry with a high arm as Terry headed the ball clear. Could easily see red for that - as Zlatan did of course when these sides met last season. Zlatan Ibrahimovic with the lay-off, Lucas with the low shot wide from 20 yards. Nice move from PSG, with Spurs flop Benjamin Stambouli looking good in midfield in the last few minutes. Where, if anywhere, do Chelsea need to strengthen ahead of the big kick-off? Radamel Falcao and Loic Remy as back-up to Diego Costa good enough? Perhaps a centre-back light? Hoping PSG turn them over but think Chelsea may gain a little bit of revenge (even though it means little in comparison) for their Champions League exit and win 2-1. Costa and Hazard with the goals too. The crowd in Charlotte are enjoying the start to this game, it's not full but it's noisy enough. Can't be long before we see Premier League games played abroad, right? I'm not saying I agree with it, but I think it will happen. The NFL and NBA are coming to our shores more often, the tide will surely go both ways...? Very bright start from Chelsea. Eden Hazard beats two men on the left with ease and wins a corner which Diego Costa heads on goal. It drifts wide. Started in a competitive mood this one. Cesc Fabregas gets his Achilles raked by Blaise Matuidi before Victor Moses beats a man and puts it on a plate for Branislav Ivanovic. You expect him to bag there, but his touch is poor. Will Victor Moses be at Chelsea on September 1st? It doesn't look like we will ever see Zlatan Ibrahimovic in the Premier League now, shame that. The big man's first touch is shoddy though, shanking it out of play on the full. David Luiz is always an entertaining watch and the former Chelsea man almost hooks in an own goal with his first touch. Diego Costa starts an argument after 35 seconds. Pre-season? Costa plays one way. Hard. Serge Aurier is bumped to the deck and doesn't like it, referee has to weigh in. Game on! PSG in their change shirt of all white. We shall bring you reaction from California when we have it, perhaps an update on the whereabouts of Angel Di Maria too. Meanwhile, here come Chelsea and PSG in jovial mood in the tunnel. Strong XI from Chelsea tonight. Frantic finale, entertaining game. Good pre-season match. Barcelona back in the game for oooh 45 seconds or so. Adnan Januzaj springs a dodgy looking back four to run in and smash home left-footed. Game over, workout done. Ivan Rakitic - scorer in the Champions League final six weeks or so ago - has looked classy since he came on and he forces Sam Johnstone into a low save. Good strike. Our first pictures from Charlotte are coming in, Chelsea boss Jose Mourinho looking as calm as ever. He'll want a much better showing from his side tonight. Will Manchester United keep a clean sheet? They are rather hanging on but Paddy McNair does well to block a low shot on goal. Quote Message: United's second string have quickly imposed themselves on this contest. Given half an hour to shine, Jesse Lingard has scored, Adnan Januzaj has gone close and Ander Herrera unsettled the Barcelona defence with a forceful burst. Herrera is part of Van Gaal's first-team plans but the futures of Lingard and Januzaj, who failed to build on an impressive 2013-14 campaign last season, are not so certain. United's second string have quickly imposed themselves on this contest. Given half an hour to shine, Jesse Lingard has scored, Adnan Januzaj has gone close and Ander Herrera unsettled the Barcelona defence with a forceful burst. Herrera is part of Van Gaal's first-team plans but the futures of Lingard and Januzaj, who failed to build on an impressive 2013-14 campaign last season, are not so certain. Barca are very unlucky not have scored tonight. Great cross in this time from Sandro on the right and Ivan Rakitic can only shin the ball wide. Lingard always has a good pre-season with us but never manages to do it over the course of the season. Feel he'll be out on loan again with Januzaj and Pereira ahead of him in the young talent stakes. Has James Wilson got what it takes at this level? The jury is out for me. Great pace, which we know he has, to burst in behind but he can't cut it back to a team-mate. It's not the Class of 92 but United have some talented youngsters coming through. Adnan Januzaj bursts over the top onto a smart through-pass, he puts over a hard, low cross which the keeper can only parry and Kesse Lingard and Andreas Pereira are both close to sweeping it in. It was youngster Munir who headed against the post for Barcelona. A potential Stoke signing of the future? If any Manchester United fans are getting a bit giddy don't forget that a certain Mr. Messi and Mr. Neymar are still to come back into this Barcelona side. And they hit the post for a third time! From a set-piece this time, Ivan Rakitic whipping the ball in and it's headed against the post. More changes for Barca now as some of their youngsters get a taste. Sandro is one of them. Munir another. Marouane Fellaini stood on Jordi Alba as he tried to block that goal from Jesse Lingard. Clumsy rather than malicious from the Belgian. Another Belgian has the chance to put the nail in Barca's coffin as Adnan Januzaj bends a great chance into the side-netting! Lovely pass from Antonio Valencia to send him away. That may be the highlight of Jesse Lingard's season as he scores against Barcelona! Only been on the pitch for a minute or two as he meets Tyler Blackett's cutback from the left to sweep into the net. Jordi Alba has picked up an injury trying to block that. Manchester United making changes, lots of them. More changes of cast than a Sugababes convention. That happened very fast, was it 10 changes?I'll round them up for you shortly. Ex-Arsenal man Thomas Vermaelen missed 99% of last season with injury and is coming off here after an hour. He's replaced by Jeremy Mathieu, who can score a goal or two. Still a decent game this. Beauty! Ivan Rakitic lines up a free-kick as David De Gea bellows to his wall, he wants them to move but Rakitic doesn't hang about, smashing a drive over the wall and onto the roof of the net. Fine drive. Barca are bossing the ball now, making United chase it in the Californian sun. Sergi Roberto frees Luis Suarez with a neat touch around the corner, Suarez wants to nutmeg the whole team and eventually tries his luck once too often. That's better from Memphis, great pace to get in beyond the Barcelona backline as Wayne Rooney cleverly let the ball run, Gerard Pique gets back into him but Memphis shapes the ball on to his left foot and shoots at Jordi Masip. Rooney then shoots moments later but like his team-mate he can't find the power. The best thing about Memphis Depay so far is that every time I hear his name I think of the Pixies track, 'Letter to Memphis.' Classic. Was used on goal of the month at one stage too, if my memory serves. Is he any good though? Hard to evaluate on this display. Not sure if behind the main man is where he wants to be. First booking of the night/afternoon is shown to Phil Jones. In fact, the only changes at half-time see Ivan Rakitic and Jordi Masip come on for Barcelona. Masip is in goal. SMS Message: Andrew, London from Remember how well Utd did in last year's pre-season! Don't get carried away! Hopefully it will be a better season overall. Remember how well Utd did in last year's pre-season! Don't get carried away! Hopefully it will be a better season overall. A bit of Ed Sharpe and the Magnetic Zeroes welcomes the sides back out for the second half. Lovely stuff. Doesn't look like mass changes for either side. Don't forget that there's another game coming your way tonight as we go some way to filling the MOTD void in your lives. Chelsea XI: Begovic; Ivanovic, Cahill, Terry, Azpilicueta; Mikel, Matic; Moses, Fabregas, Hazard; Diego Costa. Quote Message: Perfectly acceptable scoreline for Manchester United but Luis Suarez in particular will wonder how Barcelona are trailing. The Uruguayan has hit both posts and caused United's defence no end of problems. Sergio Ramos remains a target for Van Gaal. On this evidence, it is easy to see why. Perfectly acceptable scoreline for Manchester United but Luis Suarez in particular will wonder how Barcelona are trailing. The Uruguayan has hit both posts and caused United's defence no end of problems. Sergio Ramos remains a target for Van Gaal. On this evidence, it is easy to see why. So far, so good for Manchester United. Very entertaining pre-season game. Wayne Rooney sees a pass hit his heels and end another good counter-attack, Barca then win a corner but United clear well. Speaking of big losses to the Premier League, what an effort again from Luis Suarez! A magnificent striker, he really is. There appears little danger when he ferrets away at the ball 30 yards but Suarez manages to turn on to his left foot and crash an instant strike against the far post. Brilliant. He then squirts a low shot in on goal which David De Gea saves. A worry for both managers as Luis Suarez and Phil Jones go in for a challenge and the surface really cuts up under their feet. The sort of studs-stuck-in-the-pitch moment that can lead to a nasty knee injury. Thankfully, they are both OK.
Andres Iniesta then produces a rangefinder of a pass, 40 yards over the top right into the stride of Jordi Alba. The left-back can't summon it from the sky though. He's no Jerry Rice. Sergio Busquets flicks on a corner but David De Gea pouches it easily. See you in El Clasico, he may have said. He almost certainly didn't of course. Real Madrid's probable gain will be Manchester United and the Premier League's loss. Who can replace DDG at OT? TBC. Memphis Depay has been fairly quiet but that's a nice touch, clipping the ball on the volley back to Juan Mata in the centre-circle, Mata has the guile but not the speed to get away from Pedro though. Quote Message: With such a huge question mark over Di Maria's future, Ashley Young has a chance to prove he can step in. Young was one of United's more consistent performers last term but United are being coy about offering him a new contract. His present deal expires in 2016. He is causing Barca a few problems here cutting in from the left flank. With such a huge question mark over Di Maria's future, Ashley Young has a chance to prove he can step in. Young was one of United's more consistent performers last term but United are being coy about offering him a new contract. His present deal expires in 2016. He is causing Barca a few problems here cutting in from the left flank. Matteo Darmian likes an overlap and the Italian bombs on to put over a neat low cross, Barca make a hash of getting it away and Ashley Young takes a tumble in the aftermath. Penalty? Nope. First I've seen of Darmian in a Manchester United shirt and he looks a big upgrade on what they had before. Our man in the 'field of jeans' Simon Stone says there are plenty of empty seats on display despite this supposedly being a sell-out. I can't imagine there is much to do on a Saturday afternoon in California which could dissuade you from watching a friendly. Ashley Young sends in a shot after a neat move and Marc-Andre ter Stegen just about shovels it over the top. Wayne Rooney gets in behind and forces Marc-Andre ter Stegen into a save at his near post. From the corner, Barca are again unconvincing but the ball skips through. Good news for any Sheffield United fans reading - you've signed Billy Sharp from Leeds. Again. Bad news for any Sheffield United fans reading - you've also signed Conor Sammon. What a touch from Andres Iniesta, deft backheel with a side-salad of disguise to send Jordi Alba away. His cross is heading for Luis Suarez and heading for 1-1 but Phil Jones does well to head away. As Si Stone mentioned earlier, the Daley Blind-Phil Jones axis looks the weak link in this Manchester United team. Memphis Depay produces a smart turn tight to the touchline but then ruins his neat work by clipping it out of play. Barcelona having a good spell now with the impeccable Andres Iniesta becoming more influential. A question from the BBC Sport football desk: is there anything to dislike about Andres Iniesta? Quote Message: Been a decent enough start offensively for United, who are ahead thanks to Wayne Rooney's header. But Daley Blind does not convince as a central defender. Blind conceded the free-kick that Luis Suarez curled against the post and Barca are keen to exploit the space he is leaving to Michael Carrick and Morgan Schneiderlin, who are supposed to be screening him. Been a decent enough start offensively for United, who are ahead thanks to Wayne Rooney's header. But Daley Blind does not convince as a central defender. Blind conceded the free-kick that Luis Suarez curled against the post and Barca are keen to exploit the space he is leaving to Michael Carrick and Morgan Schneiderlin, who are supposed to be screening him. Louis van Gaal will be pleased with this so far, his side looking very sharp on a sandy pitch. Barcelona's season starts later and it shows in these early stages. They are a few steps back on the pre-season ladder. Andres Iniesta gives the ball away - it must be pre-season. Manchester United impressing now in their play, Memphis linking the play up well, Luke Shaw looking fit and sharp, Juan Mata a threat from the right. If this Barcelona side have an Achilles heel, and that's about as big an if as there is in football, it may be defending set pieces. United have taken advantage of slack defending to take an early lead. Morgan Schneiderlin launches into a wild challenge and is lucky not to make any contact. Rubbish defending. Rubbish from Adriano as he gets under the flight of Ashley Young's corner, Wayne Rooney doesn't have to jump to thump a header into the back of the net. 'GOOOOALLL FOR THE CAPTAIN! WAYYYYNNEE ROOONEEYY!' screams the announcer. A stereotypically optimistic outlook on display from the Californian crowd so far, all on their feet as Juan Mata picks the ball up 45 yards from goal. I imagine they laugh at the Wembley crowd at NFL games too. But here's a chance again at the other end, David De Gea back in the role as one-man barrier to keep out a shot from Sergi Roberto. United's defence in tatters. Brilliant! Luis Suarez bends the free-kick over the wall, David De Gea doesn't even move but the strike fires back off the inside of the post. New boy Memphis Depay is very much playing through the middle, behind Wayne Rooney. Perhaps they will exchange positions throughout. Ashley Young's first touch brings a huge roar in California. Bizarre. He feeds in a cross from the left and Wayne Rooney almost has a shooting chance. Barcelona president Josep Maria Bartomeu said yesterday he still viewed United as a threat. This game will in no real way reveal whether or not they are but let's pretend that it may do eh? Can United challenge in the Champions League this season? They are under way in CA. It's all very friendly in the tunnel as David De Gea embraces several Spanish team-mates on the Barca side. Michael Carrick also has a friendly natter with former United defender Gerard Pique. It's a massive stadium, very steep sides as a bit of Emerson, Lake & Palmer welcomes the sides to the field. I'll give you £1m* if you could score in that net past Champions League winning goalkeeper Marc-Andre ter Stegen. Almost time for kick-off in California. It's very sunny - obviously. Anyone ever been to Santa Clara? This is the new home of the San Francisco 49ers and the press box is eight storeys up. I'd need new glasses to cover a game from up there. Quote Message: Instead of reporting for duty in San Jose later today as United manager Louis van Gaal stated yesterday, it is now anticipated Angel Di Maria will head to New Jersey, where PSG are based during their US Tour, for a medical. United fan Ryan Chelva, pictured, does not think selling their record signing is a good idea. "If it's true. is disappointing," he said. "Di Maria is a quality player who proved when he first joined he could play for Louis van Gaal. "Really you should give someone of that ability more than one season." Instead of reporting for duty in San Jose later today as United manager Louis van Gaal stated yesterday, it is now anticipated Angel Di Maria will head to New Jersey, where PSG are based during their US Tour, for a medical. United fan Ryan Chelva, pictured, does not think selling their record signing is a good idea. "If it's true. is disappointing," he said. "Di Maria is a quality player who proved when he first joined he could play for Louis van Gaal. "Really you should give someone of that ability more than one season." It's been a case of evolution, not revolution, for Louis van Gaal and Manchester United so far this summer. Expensive new signings Matteo Darmian, Morgan Schneiderlin and Memphis Depay all get a run out tonight while fellow new boy Bastian Schweinsteiger has picked up an injury. David De Gea is between the sticks and it sounds like he'll be there to stay now. Until next summer, anyway, when he'll be swapping Manchester for Madrid. Adios? If you're of the belief that pre-season means nil, then look away now. Earlier, Alex Iwobi scored his first goal for Arsenal as they continued their preparations for the new season with a 6-0 friendly win over Lyon. The 19-year-old winger, who is the nephew of former Bolton forward Jay-Jay Okocha but is only so good that they named him once, capped an impressive first half with Arsenal's third goal. Olivier Giroud, Aaron Ramsey and Alex Oxlade-Chamberlain were also on target for the Gunners in the first half. Mesut Ozil netted a fifth on the hour before Santi Cazorla's late strike. 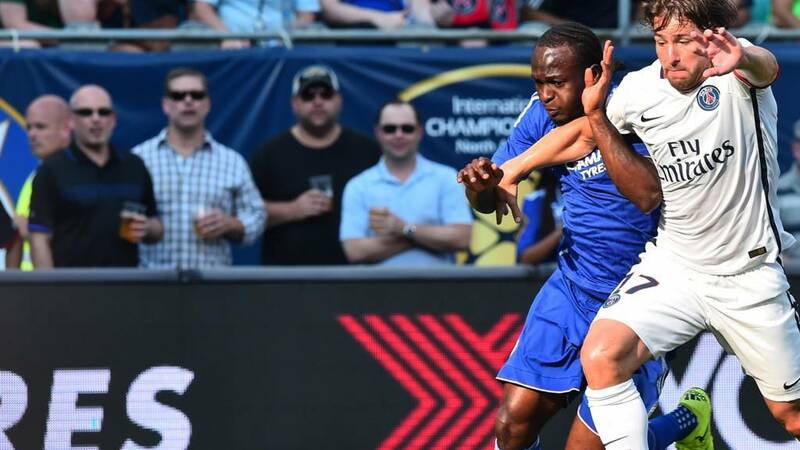 Later on tonight it's Premier League champions Chelsea's turn in front of the US cameras. They were surprisingly handed a 4-2 friendly defeat by New York Red Bulls in the week and Jose Mourinho will not laugh off a repeat performance. North Carolina is the venue for that one. State capital? Raleigh. Obviously. A big test for Manchester United and, later on, Chelsea tonight then. Or alternatively do you live and breath every cough, spit and column inch? Let us know. Quote Message: Louis van Gaal said on Friday that his Manchester United line-up would be a pointer to his intending opening day team to face Tottenham on 8 August. What can we read from it? Memphis Depay continues to be used as a number 10, operating behind Wayne Rooney. The formation is less 4-3-3 and more 4-2-3-1. Daley Blind is seen as the automatic replacement for Marcos Rojo - who is due to join up with the squad later on Saturday - as Phil Jones's partner in central defence. And the reservations Van Gaal had about Luke Shaw's fitness 12 months ago seem to have been dispelled. Louis van Gaal said on Friday that his Manchester United line-up would be a pointer to his intending opening day team to face Tottenham on 8 August. What can we read from it? Memphis Depay continues to be used as a number 10, operating behind Wayne Rooney. The formation is less 4-3-3 and more 4-2-3-1. Daley Blind is seen as the automatic replacement for Marcos Rojo - who is due to join up with the squad later on Saturday - as Phil Jones's partner in central defence. And the reservations Van Gaal had about Luke Shaw's fitness 12 months ago seem to have been dispelled. Quote Message: Game day at Levi's Stadium. A meeting between Champions League winners Barcelona and Manchester United in the ground that will play host to the 2016 Super Bowl. The big talking point concerns someone who won't be here though. Reports in France suggest a £45m deal for United to sell record signing Angel Di Maria to Paris St-Germain has been done. United are refusing to comment. Game day at Levi's Stadium. A meeting between Champions League winners Barcelona and Manchester United in the ground that will play host to the 2016 Super Bowl. The big talking point concerns someone who won't be here though. Reports in France suggest a £45m deal for United to sell record signing Angel Di Maria to Paris St-Germain has been done. United are refusing to comment. The glitz, the glamour, the glory? The new Premier League season is just two weeks away and tonight pre-season preparations for two of the division's giants ramps up a gear. Yes, it's only pre-season. Yes, results don't really count. But get a battering from Barcelona or a pasting from PSG and morale could take a real dip. Manchester United face arguably - certainly? - the best team in the world in Barcelona, while Chelsea have a very tough test on their hands in Paris St-Germain.